Remember when Marty Markowitz claimed that DOT had secretly tipped off cyclists to ride the Prospect Park West bike lane and inflate DOT’s cycling counts? Well, if you live on Plaza Street, Marty tipped you off to last night’s Community Board meeting about the Plaza Street bike lanes. Granted, the letter isn’t specifically targeted to motorists, nor does it explicitly call for them to speak out against the plan, but the tone is pretty clear. I’ve joked before that any claim a bike lane opponent makes about the powerful and radical bike lane lobby is likely to be little more than the equivalent of “I’m rubber and you’re glue,” and there’s no better evidence than this letter. When’s the last time Marty used the influence of his office–and our taxpayer dollars–to alert people to the significant changes coming to the area that didn’t involve bikes? 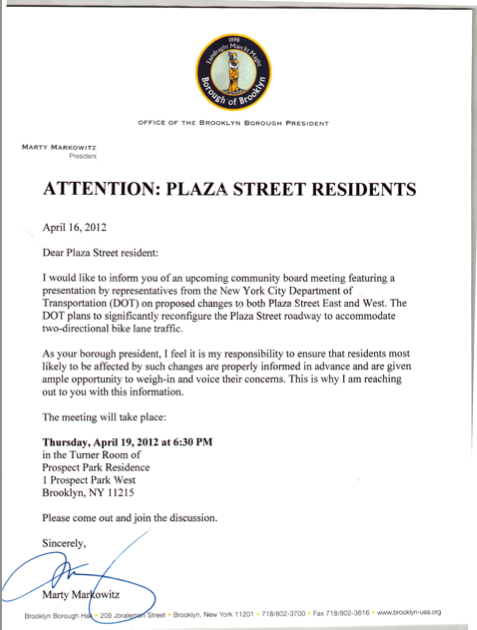 That being said, I’m glad everyone, opponents included, had the chance to weigh in on Plaza Street last night. That’s democracy in action and it was on full display. While I’m disappointed that we were unable to push Class 1 bike lane through both transportation committees, I do think this plan is a baby step in the right direction towards full protection. If anything, it creates a “greenprint” on Plaza Street that further legitimizes cycling as a valid transportation choice and sets a precedent that contra-flow bike lanes are accepted practice. I’m especially proud of the way complete street activists and supporters behaved themselves at the meeting. I’m sure the “other side” might say the opposite, but everyone who spoke in favor of full protection and improvements for cyclists and pedestrians was respectful and considerate. The hissing, booing, and wild exclamations from angry motorists–at one point someone yelled at a nervous 8-year-old bike lane supporter–included a tired list of complaints that were so selfish (“Now I have to look both ways!”) and laughable (“Bikes cause pollution!”) that it actually gave me hope. When the best arguments opponents can come up with are the same ones that were dismissed the last time around you know we’re winning. Evidence of that came from the parts of the meeting that most people did not see. Our committee approved Park Slope’s first on-street bike parking, to be located in front of Gorilla Coffee at 5th and Park Place, and a set of bike lanes for 3rd Street in Gowanus. More on both later. I must say that the decision to install contraflow lanes instead of a protected bike lane represents a step backwards, in my opinion. First, this sets a precedent that this type of design works well, which I believe it will not. I say this because the existing condition does not work well (rampant double parking & driving in the bike lane) and the proposed changes do nothing to address these problems, and contraflow biking will simply add an addition conflict to these problems. Yes, contraflow riding will be legal, but before lots of people simply did it anyway, so I see that improvement as pretty minimal for cyclists. Also, this proposal practically codifies double parking in the bike lane as acceptable behavior instead of actually dealing with curb usage issues. It shows a DOT that is absolutely terrified of removing any parking in the wealthiest parts of Park Slope. Finally, it shows that if you have a political connections and money, you can get your way. These negatives outweigh the positives, in my opinion. I’m sure there are bigger issues at play here for DOT, such as wanting to get bikeshare up and running, prioritizing protected lanes in more critical areas such as Manhattan avenues, and a desire to avoid the conflict and expense of lawsuits. I understand these things, but I am still quite disappointed. I guess we’ll just have to wait a good bit longer for a true network of protected bike lanes in Brooklyn. When those wobbly, fresh bikeshare riders pick up their bikes from the station on Plaza Street and set out on that crazy, unsafe bike lane approved last night straight into an oncoming dollar van, it won’t be unprotected for long. I’m pretty sure Marty Markowitz never sent a letter to Daniel Goldstein informing him of Bruce Ratner’s plans to “significantly reconfigure” his living room. What an abuse of public letterhead…and office! Who is running against Marty next time? Even if it is a rodent, it has my vote. Marty is on Twitter and Facebook and always posts notices about events and meetings. Only when he is opposed to bike lanes though does he do something secret like this. Wouldn’t want word to get out to the wrong people before the meeting, would he?